We were lucky that the car, Toyota Land Cruiser, was just the right car for this kind of exploration. There are some roads where I thought normal cars would just go backwards and might even slip and fall off the cliff. Omanis who live in the mountains were very friendly and they showed us the right direction when we almost got lost. We even saw some kids approaching our car and they were asking for chocolate. “Hello. Fi shokolata?” said this local kid when we passed by their home. I gave the remaining of my chocolate bars that I ate last night. With a house located at the altitude of 1,800 meters above the sea level, eating a bar of chocolate seems to be a luxury these kids can’t afford easily. After struggling to find the way, we finally we arrived at our destination at around 2.45 PM. So this is it! 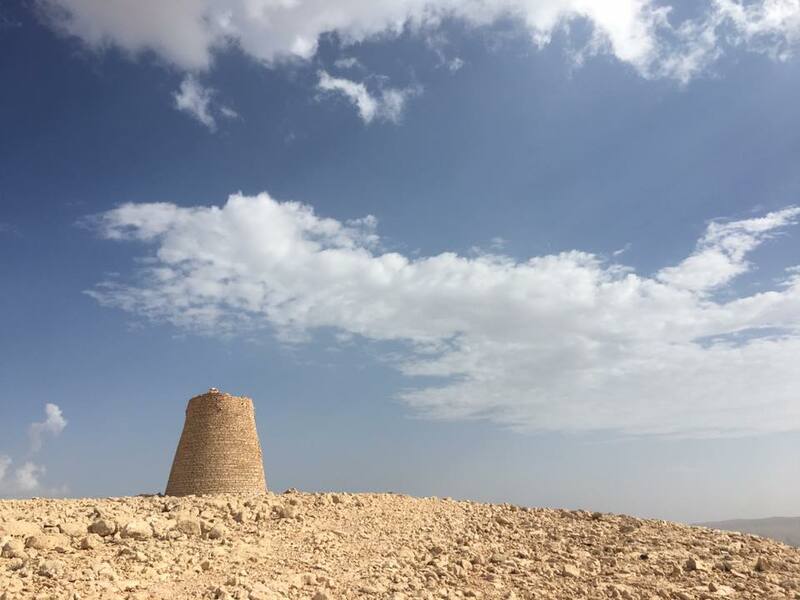 We are at the site of Al Jaylah Beehive Tombs. These tombs were first seen by a pilot during his flight over Jabal Al Akhdar. Prof Weisgerber and the team from The German Archaeological Mission successfully discovered 90 tombs in the site. The tombs are so old, based on the construction it was thought that the tombs have been there for approximately 4,500 years. One of the beehive tombs. It was beyond words to find them standing tall at such high altitude. Among all the tombs, I was fascinated by the one that stood tall in quite a distance from the other tombs. I felt something that I couldn’t really explain there. It’s as if I could feel that there was someone really important was buried there and I don’t know why, somehow I got a feeling that it was a woman there. Well, I don’t know… it might be just my feeling. Nobody ever knew who was buried there and how did they make such tombs. Al Jaylah was the last visited place for that day. It was a day well-spent and I really enjoyed it because it gave me inspiration to write. We went to Wadi Shab Resort to stay overnight and enjoy half of the third day before going back to Muscat.